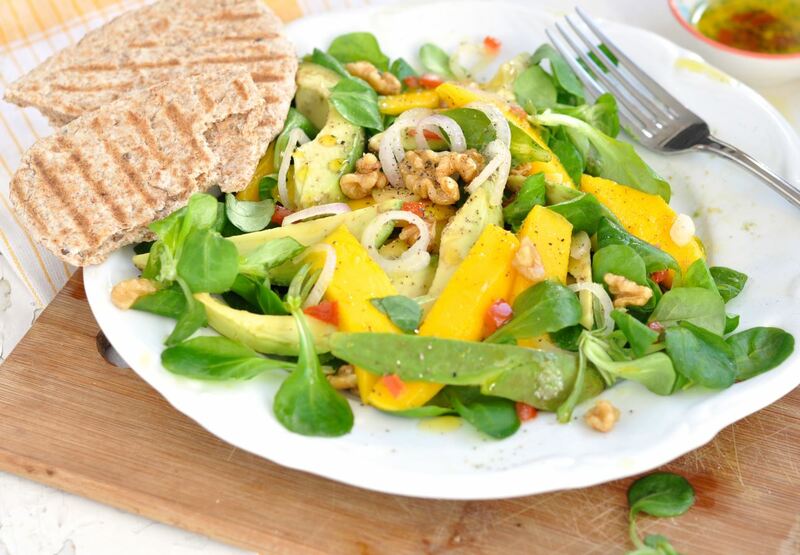 Avocado-mango salad with walnuts - Mehadrin Tnuport Export L.P. Delicious, fresh salad for every occasion! pomegranate seeds, finely diced tomato or 1/4 red pepper / chilli pepper, if you like spicy! Cut the avocado to half and cut it into small cubes with a not too sharp knife. Scoop out the avocado cubes with a tablespoon. Peel if necessary and cut the mango into small cubes. Put all the vegetables and fruit together in a bowl. If you use the red chilli, remove the seeds out and cut the flesh as finely as possible. Make the dressing by putting the oil, juice, herbs and possibly honey and mustard in a bowl. Mix all the ingredients. Pour the dressing just before serving the salad and toss gently. Serve the salad on single scales, a large scale or a nice plate. Sprinkle walnuts or pine nuts as the last of the salad. Tip: to upgrade the salad you could add shrimp, crab or smoked chicken.